At many lifts descending into the pit is a problem. Often a breakneck climbing manoeuvre is necessary to enter and to leave the pit. Some accidents have happened in the past. Since the introduction of EN81-1/2 an access to the pit is mandatory. If this is not possible, an equivalent solution must be found - the pit ladder. There are no limits for the lift companies as to the choice and the installation of the ladder. Some producers of lift components also have concentrated on the "ladder" subject and placed very different solutions on the market. Locally independent ladders are the result, which can be put in the pit if needed. Steadily mounted ladders have a great market distribution as well. 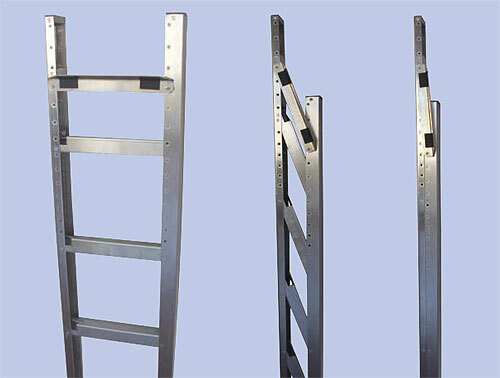 If attached to the floor or the wall, if hinged or telescopic, every ladder finds its application. The ladders which are permanently in the pit, have certainly a great advantage, because they are always available for the mechanic and cannot be used for purposes other than intended. For several years now, the company W+W Aufzugkomponenten has been offering a solution for every case. Rungs have a general width of 30mm. When climbing the ladder, the foot stands only on the small rungs. Descending safely is only possible when the ladder exceeds at least 1m above the exit point and both ladder beams serve as handholds. Steps have a minimum width of 80mm and are approximately horizontal. When climbing the ladder, the foot stands on a sure platform. In accordance with the state of the art, in case of the lift pit ladder this does not exceed the exit point if the door frame can be used as a supporting base. There is one problem that applies for every pit ladder: A special ladder type must be chosen for every lift. Different pit depths and different lift parts such as governor tensioning weight, buffers, travelling cables, counterweight and operating boxes at the cabins make it impossible to install a universal ladder type. Often the place for storing the ladder is simply not available. The solution is called "Stufiklapp"
W+W Aufzugkomponenten breaks new grounds in this field. The company attaches great importance to a leaning ladder with retractable steps. The outer dimension of the ladder in the folded state is restricted to twice the beam width plus the fixation angle. It is simply hung on a hook on the shaft wall. Due to the small dimensions there is always a place which is accessible from the landing door. 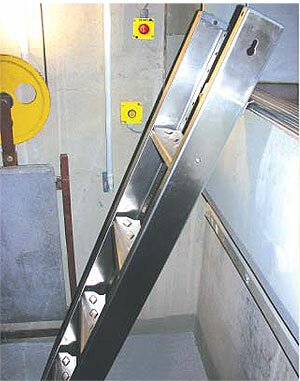 A magnet in one ladder beam assures that the beams stick together in the folded position. Pit ladders are often equipped with suspension hooks. These are hung into the door sill. Unfortunately in many cases a solid connexion that inhibits shifting is not achieved, because the door sill slots are different depending on the producer, and even the distances to the edge of the door sill vary. In case of revolving doors there are no slots at all. The solution is a fixation angle with non-skip rubbers. These provide for a safe grip and prevent a lateral shifting of the ladder. In the course of the first assembly the retractable fixation angle is screwed on at the correct height. As there are various pre-drilled holes in the ladder beams, the ladder fits universally. In accordance with EN 131 the ladder is put up with an angle of 65°-70°. Thereby a tilting backwards is prevented. The ladder Stufiklapp is made of aluminium which makes it easy to handle. Due to the non-necessary overhang the company W+W Aufzugkomponenten has only developed two ladder lengths, Stufiklapp -145 for pit depths from 0,88m up to 1,45m and Stufiklapp -175 for pit depths from 0,88m up to 1,75m. The universality saves much planning time for the lift companies when choosing a suitable ladder. Similarly the transport and the intermediate storage are less expensive than with a bulky rung ladder. In accordance with EN81-1/2 a switch monitoring is not necessary. As damage may arise from inappropriate putting into the storing position, if the ladder extends into the roadway of the lift, some lift companies prefer a switch monitoring. The manufacturer offers a space-saving accessory set. On request this set is delivered with positive separation contacts (e.g. for France). In old lift installations unfortunately you often find very uneven pit floors, which in some cases are also oily. In order to achieve a safe ladder position, an accessory set with a fixation angle and levelling sheets for the floor can be delivered. Whatever way leads into the pit, safety is the top priority. For this reason it was a matter of course for W+W to take into account the requirements of the relevant standards as a basis for the construction. A certificate of TÜVRheinland Group confirms this as well.